Each year the number of deaths in police custody rises. Black Lives Matter and UFCC are putting that message out on the streets, while state institutions stay silent. 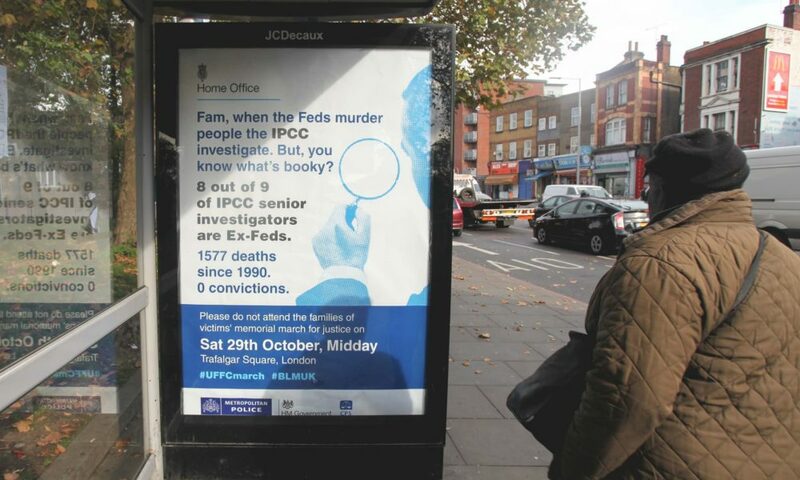 On Wednesday morning London and Manchester woke up to bus stop adverts – apparently from the Home Office – but subverted and repurposed to highlight the issue of deaths in custody. 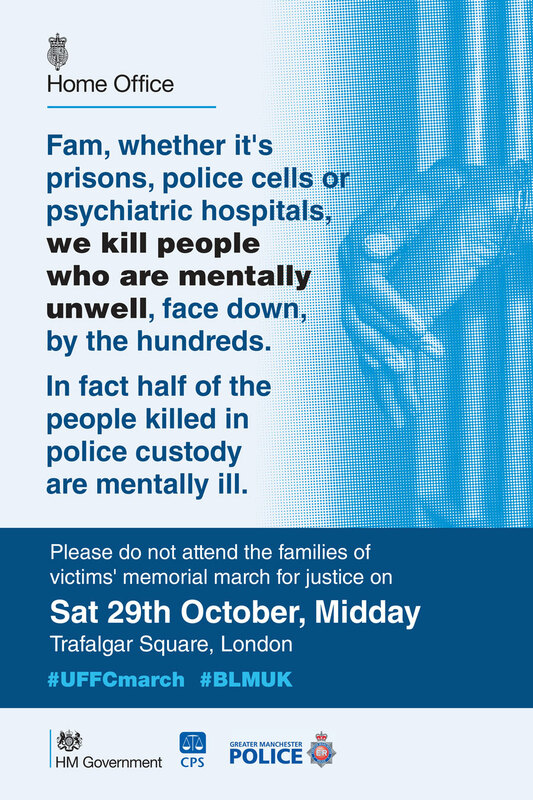 They’re designed by Black Lives Matter UK (BLM UK) to draw attention to the United Families and Friends Campaign (UFFC), and its memorial procession tomorrow. The unofficial “Home Office” posters act as a true public service announcement, reclaiming public space for a conversation that is urgently required. The UFFC is an 18-year-old coalition of families whose loved ones have died while in the custody of the state – the police, mental health institutions, prisons and immigration detention centres. Each year their numbers swell as the death count increases. It’s clear that there is no one root cause or institution to be blamed – the problems are complex and never single issue. That breadth had to be represented in our bus stop hijacks, and so we tried to draw it all together by presenting the posters in the style of those being criticised. They expose the truth that the institutions are too careful to ever say explicitly themselves, and we did it in the familiar self-satisfied tone of the often dismissive statements issued after deaths. These institutions of the state have all demonstrated disregard for the families and communities affected by their actions. In the year since the 2015 UFFC memorial procession we have seen several examples of just this. Last December Jermaine Baker was shot dead during a police operation in Wood Green. The independent police complaints commission (IPCC) arrested an unnamed officer in order to carry out its investigation, only for firearms police in the Met to respond by threatening to lay down weapons and walk off the job if he or she were charged. A tactical firearms commander involved in the same case has recently taken retirement from the police. The officer was facing allegations of gross misconduct that can no longer be addressed. Baker’s family took legal action to try to prevent the retirement, a course of action the IPCC initially said it would support. But after that support was withdrawn, a judge ruled that the officer shouldn’t be prevented from retiring, and thus escaping the allegations made. And last month the CPS announced that it had ruled out charges against officers involved in the arrest, restraint and detention of Sean Rigg. Following a damning narrative verdict from a jury at the 2011 inquest into his death, the IPCC reopened its investigation and referred the case to the CPS to consider for prosecution. 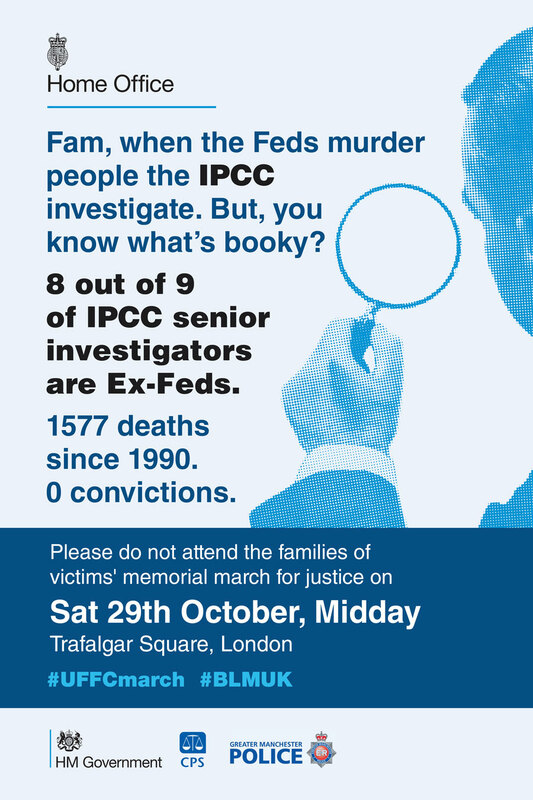 In the past eight years the Rigg case highlighted a number of failings by the IPCC and Metropolitan police, but even now the CPS continues to let down the family by refusing to prosecute. It is precisely this attitude, with each institution imagining itself free of wrongdoing and answerable to no one, that we wanted to get across in the posters. 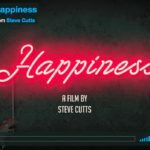 Approximately half of all deaths in or following police custody involve a person with some kind of mental health issue. It’s a familiar refrain in cases that involve prisons, psychiatric units and immigration detention too. As such it’s a shared concern for many of the families in the UFFC coalition. Yet the way that the general public appreciates deaths in custody is sketchy at best. If they were to learn the truth it would surely provide pause for thought. That is where organisations like the UFFC come in. It has been making these criticisms of the state far longer than we have at Black Lives Matter – but if we can help spread that message people will be shocked by what they learn, and change can happen. That’s why we put the UFFC at the centre of our “subvertising” campaign. BLM UK isn’t starting this conversation but drawing attention to one that was already there. That way many more of us can take action over it. 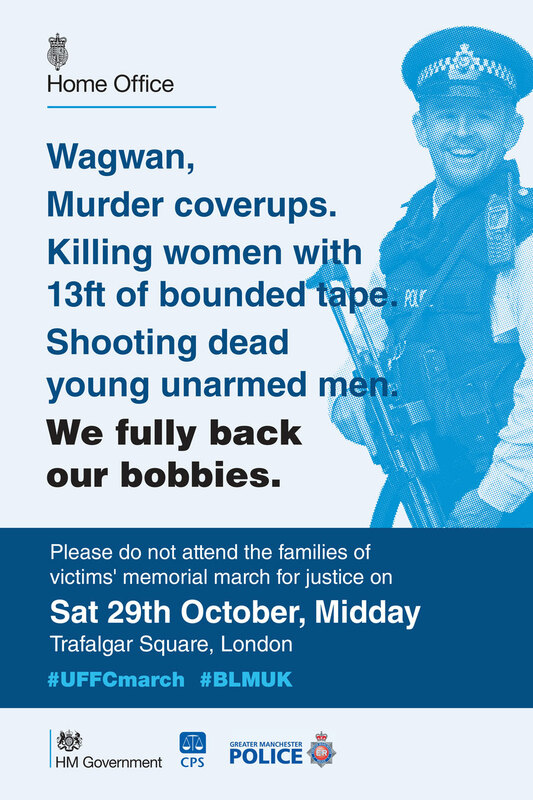 Every October the UFFC holds a march to remember those they are fighting for – it will do the same again tomorrow. 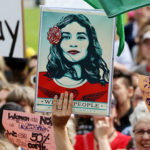 The processions have typically received far less attention than they deserve, hopefully our unofficial “Home Office” campaign can help to change that and highlight their important fight for justice. 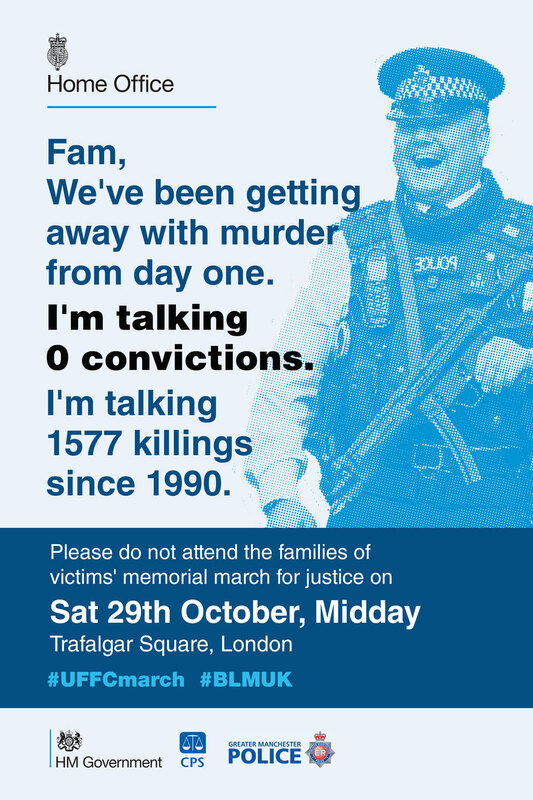 The adverts say that the Home Office doesn’t want you to join the memorial procession. That’s because the justice system has shown it can’t, or won’t, stand with these families. If they will not, then it falls to all of us to do so.